This self-paced course discusses the basic principles of warm season convective weather with the aim of improving the prediction of significant and severe convection. The course organizes relevant modules and Webcasts into two sections: Core Topics and Advanced Topics. 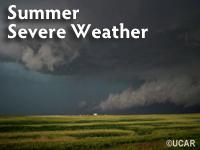 Summer severe (convective) weather presents many challenges to the forecaster. This self-paced, distance learning course addresses the scientific aspects of a few of those challenges: buoyancy, shear, and their interaction to create various types of summer severe weather phenomena (squall lines, bow echoes, supercells, etc). Summer severe weather is a complex interaction of synoptic and mesoscale forcing. As both mesoscale observations and model resolution improve, the forecaster needs a thorough understanding of this type of high impact weather phenomena in order to react properly during these rapidly evolving situations. These self-paced modules discuss the basic principles of summer severe (convective) weather with the aim of improving the prediction of significant and severe convection. There are two parts to this course: Core Topics and Advanced Topics. The Core Topics provide reviews of basic convection, including buoyancy and CAPE; understanding wind shear and the interaction of buoyancy and shear. The Advanced Topics include specific summertime mesoscale phenomena/cases and sophisticated techniques that address mesoscale convective features. Description: This web-based course focuses on integrating satellite interpretation with other datasets in analyzing severe thunderstorm events. This NWS Storm Prediction Center (SPC) (http://www.spc.noaa.gov/exper/mesoanalysis/s3/index2.html) page features numerous technical fields that are commonly used at the SPC to determine the potential for severe thunderstorms and tornadoes. There is a description available for each field/indices found by clicking on the "Overview" located on the left hand side of the page. These fields and parameters aid forecasters in mesoscale forecasting and monitoring of current conditions.